An interesting and advanced gaming variation of classic Blackjack game, Blackjack Switch is perfect for players looking for little more adventure and risk when creating their hand of 21. Blackjack Switch is just another Blackjack game except here players are dealt with two hands of two open cards and they have the liberty to switch the top cards of each hand. Two bets, two game hands and switching options are not the only thing that adds twist to a standard Blackjack gameplay. 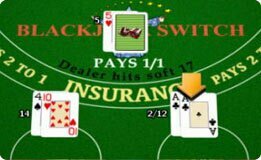 Blackjack Switch also adds to the casino or dealer’s advantage as a hand of 22 by casino is always a Push and not a Bust. Online Blackjack Switch has the standard Blackjack gaming objective; a player must create a winning hand in compression to the casino or dealer. If both the hands dealt to you, the player, turn into winning hand you win the double wager. You could also either win just one hand or both or lose it all. How to play online Blackjack Switch? It’s easy to play Blackjack Switch because it still adopts the fundamental theme of the game it was based on. This means a you, the player, must get a hand closest to 21 against the hand of the casino, without getting a bust. The best hand in any game of Blackjack is a hand with 10-value card and an Ace. Blackjack Switch is played with 4, 6, or 8 decks and the card values are same as in a regular Blackjack, which means all cards from 2 to 9 are counted as their card value, Ace could be 1 or 11 and cards like J,Q,K are valued as 10. 1- Unlike its classic variant, Blackjack Switch table has two betting areas on the table. The game starts with player selecting a betting chip and clicking on the betting areas to place the bet. Player wagers equally on both the hands. 2- Now player must click on Deal to get two pairs of hands to play with. 3- Once two sets of open cards are dealt to player, he or she has option of either playing the hands with original two cards or switching the top cards of the two hands. 4- Once switched, or not, player must first play one hand with options like Hit Stand or Double and then play the second hand with same options. Split and Double are also available in this Blackjack variant. First exception in Blackjack Switch is the fact that unlike a normal Blackjack game, here players are dealt with two hands of two open cards. Thus, player has more probability of winning with two bets in the game, as even if one hand is lost he/she might end up winning the second bet. Second exception is the feature that allows players to switch cards. In this Blackjack variant, players can or cannot (depending upon the first two cards of the two hands) switch the top cards of both the hands being played. Third exception that can only be seen in Blackjack Switch is the fact that a dealer with a hand that totals 22 is not considered as a Bust, but a Push. And the Blackjack in this variation pays even money. For Six-deck game, Super Match bet disburse 1:1 for a pair, 8:1 for 2 pairs, 5:1 for 3-of-a-kind, and 40:1 for 4-of-a-kind. This looks to allay the bad impression on the player of the instance where the 2 bottom or top cards are same. The 1st prospect of Blackjack Switch strategy is whether or not to put the Super Match bet. This bet gives a house edge of around 2.5 percent. However this is very much higher than the house edge on the main game. It’s up to the player’s daring tendency whether or not he wishes to choose this bet. The 2nd prospect is the switching option. Decision like when to switch plays a crucial role in making or breaking the game. A player must know that just because there is an option, not every game needs a switch. Lastly, card counting like in any other Blackjack game is an important part of online Blackjack Switch too.